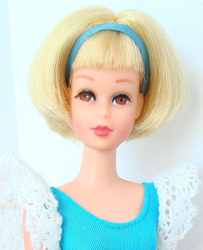 Hair Happenin's Francie (1970 - 1972) came with four hair pieces so you can change the style of her hair. Blonde center parted hair with bangs, chin length. Turquoise ribbon headband. Some dolls - some even NRFB (never removed from box) - have a lavender headband/ribbon. I do not know if this is a variation, or if the original turquoise ribbon faded/oxidized to lavender.